It's time I let you in on my dirty little secret: I am completely worthless. The pretty pictures I make have absolutely no value short of fish-wrap, and anyone who would pay good money for them is a fool. That is, unless they actually intend to install the landscape I design. Then, the work I do is priceless—the ticket to a welcoming home and a life inspired. So what's the catalyst that transforms worthless into priceless? Here in California, landscape contractors are licensed by the State to be proficient in… well, you can read it for yourself. Basically, if you've ever played in a park, strolled through a plaza or enjoyed a public garden, you've touched a landscape contractor's work. It's very different from a gardener's, or a designer's. The landscape contractor knows how to do all sorts of things I don't: how to build a fence, pour concrete, size an irrigation system, amend the soil. Their experience and expertise can make my best ideas even better. What's more, the landscape contractor is able to manage people to do those things for him or her, most often on time and on budget. Now that's talent. And without it, none of my brilliant ideas will ever see the light of day. It's obvious I hold landscape contractors in pretty high regard. But it's astonishing how many people think differently: they see landscape contractors as a commodity, a necessary evil to be dealt with as quickly and cheaply as possible. To these people, the landscape contractor adds no value, brings no expertise beyond a few extra hands to do what the homeowner can't or won't. Why, to these people, the landscape contractor needn't even be a contractor: that pesky license just makes them more expensive. To these people, there's no difference between the licensed professional and the guy signaling you in the hardware store parking lot. At least, no difference worth the cost difference. Let's be honest: there are plenty of licensed contractors whose work isn't as good as it should be. I've had a licensed contractor line "my" dry creek with concrete (thereby creating a very large and expensive bathtub). I've watched their crews install fence post footings below grade and with concave tops, ensuring premature rotting and failure. I've cleared their piles of mulch off of the new plantings. The license isn't a guarantee of quality. 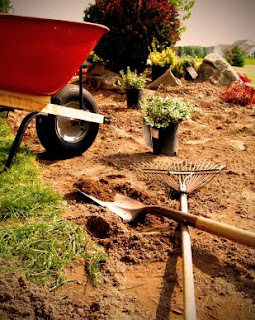 But it's a first step toward ensuring that the person entrusted with your landscaping has good intentions, education, and the integrity to right any wrongs. There are plenty of other reasons to work with a licensed contractor: They're required to carry workers' compensation insurance for their crews, which shields the homeowner from a world of pain should an accident occur on their property. They're required to pay taxes, which support our state's economy as well as important public programs. And they're accountable to the government, giving the property owner some recourse should a dispute turn into something uglier. Unfortunately, there is a huge labor pool out there hungry for work, any work, and a huge number of employers willing to exploit those workers for an unfair advantage in the marketplace. This has been termed "the underground economy," and it's estimated to cost California billions of dollars. Maybe the average backyard is barely a drop in this bucket… and maybe tens of thousands of yards statewide add up to something more. I can't control my clientele. It's their choice, whom to hire. But if the results are less than we hoped for, they're not the only ones disappointed. I know what their yard could have been (even if they don't). I know the price they paid just to save a few dollars. Hey, no one likes to spend more than we have to. But going with the lowest bidder, shunning the licensed contractor simply because they cost more than the gardener, that's just plain lazy. The responsible thing to do, I counsel my clients, is to research as many comparable contractors as needed to find one that has the right credentials and fits your style. A great place to start is with the California Landscape Contractors Association. Talk with two, three, ten if you need to. After all, you'll be in close contact with these folks for many months. Look them up on the CSLB website to confirm that their license and insurance are current (and unless they're truly a one-person show, they must have insurance for their employees). Talk with their most recent references, not just their favorites—you want to get the same crew who did quality work for their last client. And if you just can't get the contractor you want within the budget you have, turn back to your designer: we can help you "value-engineer" your new landscape design without compromising its vision. It's true, even my best ideas and most articulate plans are worthless without someone to midwife them into reality. So if you're going to the trouble and expense of hiring me, for heaven's sake don't pull up short and cheap out on the installation. Do it once and do it right. Hire a licensed, skilled, wonderful landscape contractor. You'll have the rest of your life to absolutely love the landscape we—all of us—created.